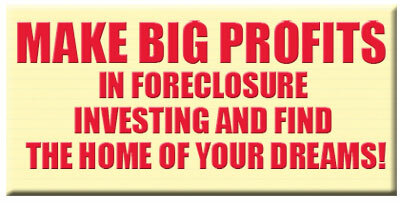 Make BIG profits in Foreclosure investing and find the home of your dreams! 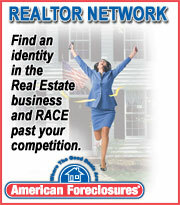 Whether you’re shopping for your first home, or profiting from today’s bargain-filled real estate market, AmericanForeclosures.com is your one-stop shop for all the latest foreclosure listings. Our nationwide database of bank and government owned properties is updated continuously, EVERY DAY, allowing you to search for the latest residential homes, multi-family dwellings, commercial, land and more 24/7 from your computer. View Sample Listing. American Foreclosures has been publishing real estate data since 1992. We’re the most trusted source for up-to-date data and realistic results. We’re the company that lenders turn to when they need to sell their foreclosed real estate. It’s easy to locate below-market value bargains effortlessly. Just fill in your preferred search criteria and your customized results are displayed immediately. Click the Details link to see more photos and additional facts about each listing. Or use our Email Alerts feature to be automatically notified when new listings match your selected criteria. Keep abreast of the latest financial news affecting foreclosures. Be notified of our seminar schedule, special discounts and promotional offers. Or just let us know your success stories. It’s all free when you register for our permission-based email list. Join now to begin searching the most affordable, comprehensive inventory of foreclosed property across the country. All for less than $1 per day.